The list of those who have attempted to leave their distinctive imprint on 'the Scottish play' stretches from Orson Welles to Roman Polanski, via a notoriously ill-judged stage collaboration between director Bryan Forbes and Peter O’Toole. Snowtown director Justin Kurzel displays little sense of feeling intimated by the hand of history as his Macbeth strides into view with a swagger worthy of an ambitious, untamed force of nature. 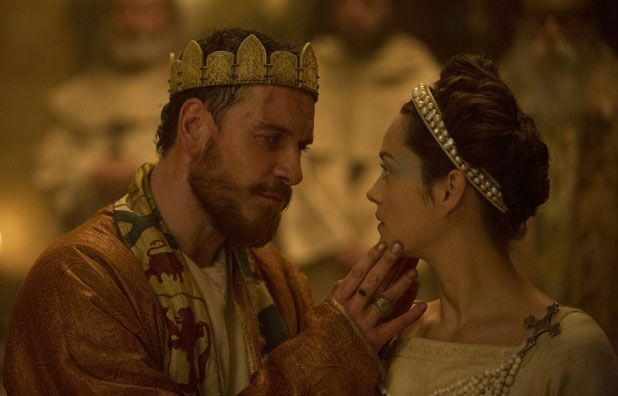 Significantly trimming the text, Kurzel’s briskly paced Macbeth places the emphasis on brutal, bloody conflict in which the spectre of death informs every act and consequence. He offers old-fashioned spectacle through the prism of a modern psychological understanding of trauma, whether it stems from the horrors of battle or the grief of a lost child. The death of an infant is front and centre from the start of the film and a prime motivation for the lust for blood that follows. The tone of the film is as savage and inhospitable as the atmospheric Scottish locations. This is a Macbeth of mud and guts, mist and murk, in which the oppressive crimson red of fresh-spilt blood becomes the dominant colour used by cinematographer Adam Arkapaw. It is a production of primal energy in which dialogue is often hard to catch and there seems an almost indecent haste to rush through the most famous speeches and return to the battlefield. An impressive cast includes Sean Harris as Macduff and Jack Reynor as a callow Malcolm but Kurzel’s approach seems to leave Marion Cotillard’s Lady Macbeth short-changed. She is outshone by Michael Fassbender’s warrior King who has all the fury and impact of Al Pacino in his prime. There are imperfections in this Macbeth but it has a raw, haunting power that is hard to deny. Screening as part of Cannes 2015. General release from Fri 2 Oct.